The Florida Adventure Tour is the number one excursion in Florida and offers a truly awe-inspiring opportunity to swim with majestic Manatees in their natural habitat at Florida’s spectacular Nature Coast. Discover a different side to Florida as you head to the Crystal River where you will meet your expert Manatee guide for a leisurely narrated boat ride through the heart of Manatee country and the chance to swim with these amazing creatures. Masks and snorkels are provided to ensure optimum viewing while under the guidance of certified dive masters. Following your quality time with the Manatees of the Crystal River you will be whisked away for a thrilling minute airboat ride before heading to Homosassa State Park where you experience Florida’s natural beauty plus a whole host of wildlife, including more manatees, bears and even a hippopotamus! The Florida Adventure Tour operates on Tuesdays and Fridays year round. The Florida Adventure Tour includes return round-trip transportation from central locations in Orlando with a pick-up time between 7.30am and 8.25am. You will need to make your way to the nearest pick-up point which will be detailed on your ticket voucher. The tour is around 10 hours in total and transfer time to Crystal River is around 2 hours each way. Wetsuits are required, they can be hired locally at a cost of around $10. 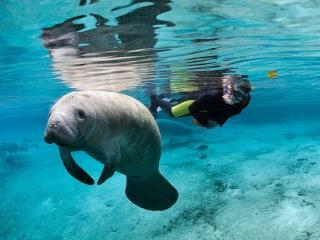 Due to the natural conditions of this experience, an encounter with the Manatees cannot be guaranteed. The peak viewing season is October to March, although there are around 80 Manatees that live in the Crystal River year round.